‘’The static sign isn’t going to disappear but the ability to supply both static and digital, integrated to complement one another and maximize the effectiveness of both, will be a significant competitive edge for any sign-maker’’ notes Mark Pigou in a recent article for SignLink (‘Welcome to the future’, May 2012). The piece highlights the compatibility between the two sign formats and the benefits sign-makers could reap if embracing the technology. This article has the same purpose. – digital displays are one of the most flexible advertising & communication platforms. They allow you to update messages at zero production costs, as often as you want and show several messages (concurrently or not) on one single display. Moreover, they are able to display time- sensitive information that can be almost instantaneously updated. – static signs cannot really be made part of the multi-screen game people play every day. This means that they’ll get ‘fewer eyeballs’ than the screens (smartphones, TV’s and digital displays). You could indeed up the game by integrating QR codes, prompting viewers to scan them using their smartphones but by doing so you will only drive their attention away from the sign. 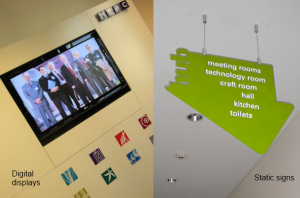 With digital signage you have the chance to make your (digital) sign the centre of an interactive exercise, surpassing the informational purpose of static signs. – the future will be digital. While static signs hold their well-deserved importance in the grand scheme of things, taking a ‘digital’ step is a strategic preparation for the future. As people become more tech-savvy they will require more and more digital information, easily accessible wherever they go. Companies will try to accommodate this need. Can your help them respond to this digital appetite? – digital signage complements an already rich offer. Most sign-makers are already providing other services such as digital printing so adding digital signage to their portfolio would only allow them to offer a complete solution to their clients. Do they want static signs? You can help. Do your clients need digital signage as well? They don’t have to go elsewhere. This would also make things easier for clients as they won’t have to deal with several suppliers and would bring sign-makers some extra- revenue. Sign-makers don’t have to go for complicated digital signage solutions but they shouldn’t avoid them either if that’s what their clients need. At the higher end of the market, the digital signage system can be integrated into different other management systems (stock, facilities management) so that the screens are automatically updated. At the lower end of the market, a cloud- based solution relieves sign-makers from the need to manage servers and commit considerable IT resources to the management of their signage networks. If you need assistance with choosing between the two solutions or you simply want to find out more about them, don’t hesitate to give us a call or fill in the contact form. Static signs are a very vital product in the earth of marketing, but to attract the crowds digital signs are needed to advertise for message. They are eye catching and useful for revenue generation.